Don’t see you camp listed here? No Worries! You can add your camp information for FREE on our Media Kit & Contact Page. Parent/Guardian must register in person at Boca Raton Community Center, Sugar Sand Park Community Center, or James A. Rutherford Community Center; registered WEBTRAC users can register on line. Parent/Guardian must have proof of residency at time of registration. All fees must be paid in full at time of registration. Non-Residents for this camp include those living outside of the City of Boca Raton and the Greater Boca Raton Beach and Park District limits. Resident registration begins February 29. Non-Resident registration begins March 14. Spaces are limited and camps are filled on a first-come, first-served basis. ALL ATTENDEES must turn in the camper forms for each child (those registering for multiple weeks need only turn in 1 set per child). These three forms, plus a signed activity waiver are required for your child to attend any program and must be turned in in advance. Science camp forms can be found on the Children’s Science Explorium camp webpage! CLICK HERE to DOWNLOAD our Summer Program FLYER & see all programs at a glance. 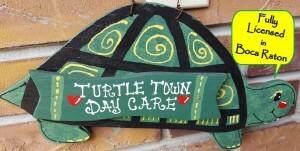 Turtle Town Day Care is a licensed in home toddler day care located in Boca Raton. If you need a daycare for you toddler, there is truly no better, more loving, fun, and safe place around! Click Here to learn more about Melissa and Turtle Town Day Care. Registration opens this month for spring break camp at West Jupiter Recreation Center, Jupiter. Spring break camp runs March 18-25, 9 a.m.-4 p.m. $100/total, $20/day. For registration dates and procedures, click here or call the recreation center at 561-694-5430. Spring break junior golf camp will be taking place at Palm Beach County golf courses. Each camp features the latest techniques taught by PGA and LPGA professionals. Campers can sign up for single days or the full week, with prices varying by location and number of days. Click here for spring camp information or call the desired golf course directly. Camp Description: We offer sports, arts and crafts, cooking lessons, dance lessons, field trips and much more! Offering a huge variety of summer opportunities for kids in Kindergarten through age 14! There will be half-days, full days and multi week options, with science, theater, dance and much more. Click here to find out more about all the exciting camps coming to Sugar Sand Park this summer!. What: In addition to learning to draw and creating amazing art projects, students will explore the historic art museum and engage in play that facilitates social, emotional and cognitive growth. Spanish language, culture and arts Summer Camp will be offered from June 13 until August 12 during the summer of 2016 in Boca Raton. Send your children on a journey to explore, create and learn this summer! Through interactive activities, games, dance, and art projects kids will learn to understand and speak Spanish, explore the rich culture of Hispanic countries, and create their own masterpieces. Each session will focus on two Hispanic countries, and students will learn about dance, food, and visual arts of that country, and will create their own daily art project. Tons of Gymnastics all day with specials each day including Karate for all by Villari’s Martial Arts; Dance (by Dance Theatre), Cheer (by US Cheer), and Rhythmic Gymnastics (by Premiere Rhythmic Gymnastics) for girls, Soccer Drills (by Soccer Shots), Sports Kinetics (by Kidokinetics), and Conditioning (by Optimum Personal training) for boys. activities include super huge bounce houses, an air trak and a tumble trak. See Summer Camp Activities Calendar for more information. Children and teens will be immersed in the native world around them through outdoor fun and hands-on activities! Games at the beach, dipnetting in the lagoon, and cane-pole fishing are just a few of the outdoor adventures that bring our campers back year after year. Older campers learn to canoe and teens take a boat trip to Peanut Island.NEW this year…we are offering morning AND afternoon sessions (same activities). Don’t let your child or teen miss out on an amazing and educational summer camp experience they’ll never for-get! Sign up early to save your space for either a morning or afternoon session of fun and learning with Gumbo Limbo! Camp shirt, sneakers, healthy snack/drink, and a refillable water bottle required daily (please label all items); hat, bug repellant, and sunscreen recommended for all outdoor activities; parents will be notified if special attire/equipment is required for certain activities.There is no Open House for Gumbo Limbo Camp. Drop-off and pick-up will be in the Lab building unless otherwise specified. In addition, Session 3 participants need to pack a lunch. For more information, please contact Gumbo Limbo Nature Center at 561-544-8605. Each week offers a unique wildlife theme as participants experience zoo keeping activities, behind-the-scenes tours, scavenger hunts, enriching conservation education activities, an d interactive fountain time. Every day participants will enjoy up-close animal encounters, animal exhibit visits, crafts, games, and much more! Wildlife Conservation Academy (Ages (15-17) The Wildlife Conservation Academy is a week-long summer experience for high school students who are interested in zoological sciences, veterinary medicine, wildlife conservation and other animal-related careers.